I was perusing Pinterest during the week when I came across the photo below, and my heart skipped a beat. 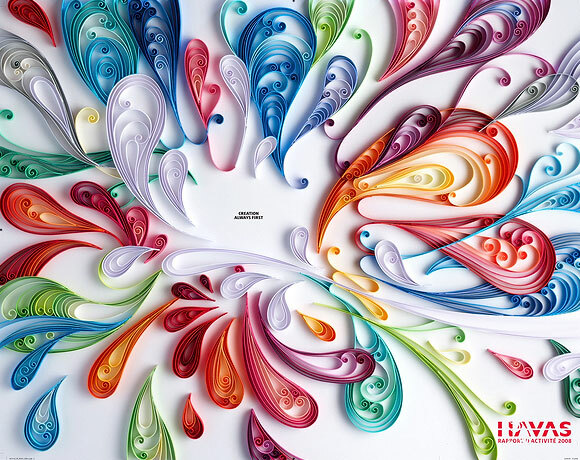 The movement and life of the colourful swirls left me so excited and inspired! 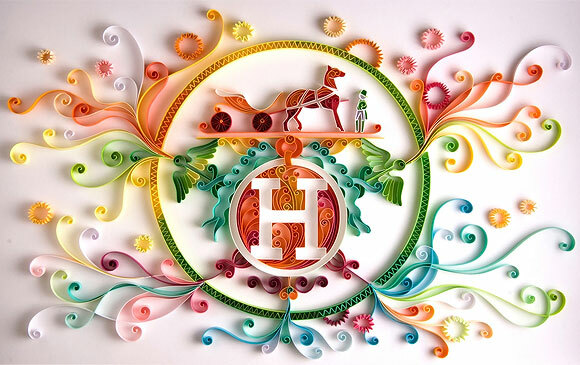 This old craft called quilling is the specialty of London graphic designer Yulia Brodskaya. Thanks to her unique craft, abilities and (clearly) patience, Yulia busted into the advertising world immidiately after receiving her degree in graphic design, and has been keeping very busy since. With an extensive and impressive list of clients, each custom creation is hand made, and is always beautifully detailed, delicate, and whimsical. 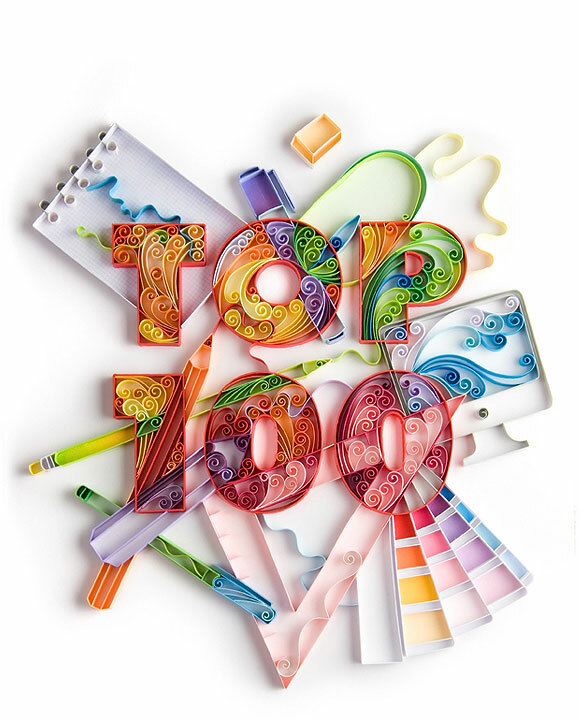 Most designs have an abundance of saturated colour and exude a happiness that comes off the page and immediately brightens your mood. 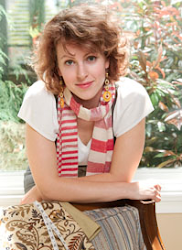 Yulia has designed artwork for almost everything - books, galleries, magazines, car and phone companies, and Starbucks...to name a few. 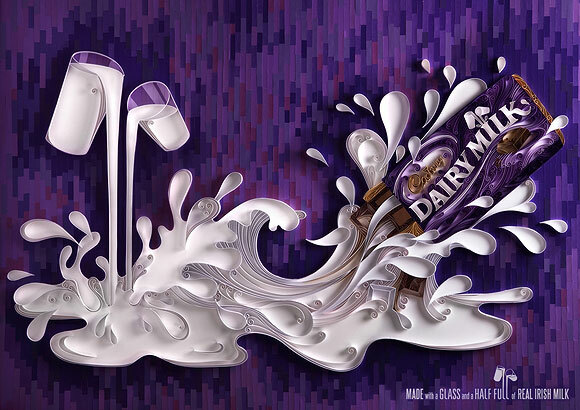 And though every image makes me lose my breath a little, this Dairy Milk ad seems to impress me most at the moment - perhaps because it's so artistic and realistic at the same time. 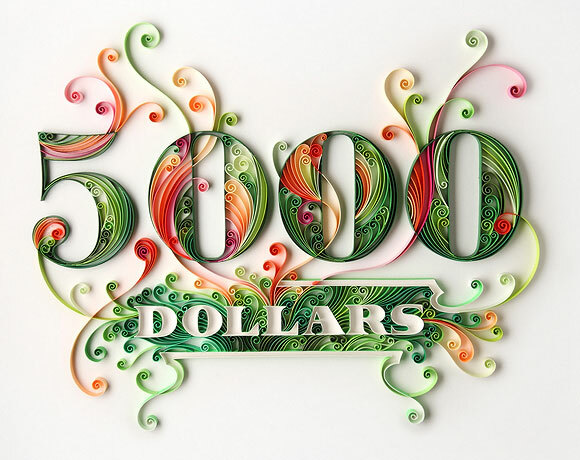 I'm sure we will be seeing more of Yulia's awe-inspiring work in the future, but for now be sure to check out her website to see her extensive portfolio of beautiful paper graphics! Posted by Unknown at 3:33 p.m. I actually tried a version of this when I was a kid. I remember linking it. These are just stunning. I was also trying to leave a comment on your newer post, shadowboxes, but could not see where to click? I was never introduced to this as a child, but I'd love to try it sometime! I'm not sure why there's no Comment option in the Shadow Box post - I will try to resolve that. Thanks Linda!